Imagination these days is undervalued. Kids no longer really need to exercise their imaginative faculties as it’s all laid on a plate for them in video games, movies that leave nothing to the imagination and TV. Yes, we had movies and TV growing up to but they still needed the support of an imagination. Our TV was in black and white until I was in my early teens and so you had to fill in the missing details for yourself. Special effects were pretty naff too and required imagination. 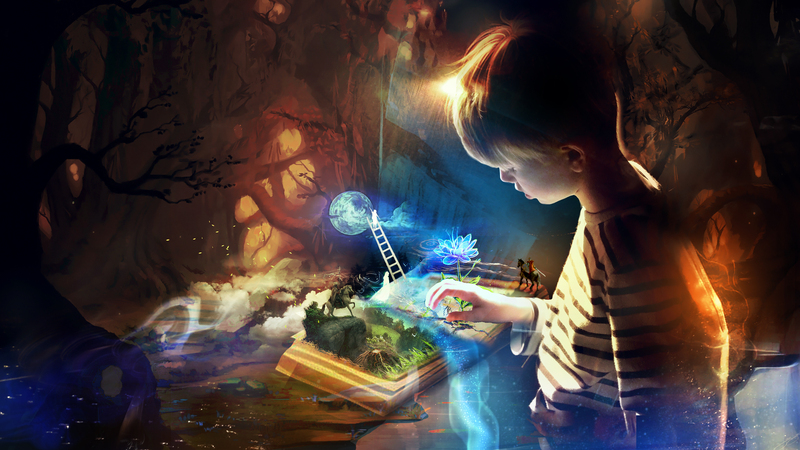 Rather than play video games, I read books – a powerful tool to enhance your imagination. The human race is essentially being gently but surely relieved of its need for an imagination. I wonder if there is a motive behind this? Imagination, and I don’t mean day dreaming here but the power of the mind to create images, is the key to magic. Yes, I know many of you do not believe in magic and think me a rather bizarre old mystic who you nicely humour when he talks about magic, but you are sadly wrong. That we do create our reality I think these days is factual. You can google how the brain functions and how in fact, our mind creates the images, smells, sounds and so on that we sense. You can discover in physics how the reality we live in is mostly nothingness between particles and yet somehow, our mind makes things seem solid. I could go on but I won’t. Reality exists only inside your head and what actually is is so strange it is best not to think about it. Thoughts are things too. I hear you laugh. Seriously, thoughts are things and with enough shall we say energy or the right type, they can manifest as your reality. To be honest, given that what you perceive doesn’t actually exist anyway – aren’t you living in a make believe world of thought forms? Look at the wall. Actually, its just a bunch of atoms and is largely open space and yet it seems solid to you. It’s an image created in your mind isn’t it? So, if you could imagine, imagine so well you could actually see it, what would happen? In essence you are already imagining a wall of a certain color so have fun and imagine it a different color. If you are good at imagining, it will appear the color you imagine. So there you go… Do you begin to understand why imagination is so important? What we see, hear and believe was taught to us. In essence, reality is a sort of preferred long utilized imagined version of actuality isn’t it? So, who told you to see the world you see? In part, the very same people that are robbing us of our ability to escape from their desired version of reality right now – all around us, all the time. By the way, the neat thing is that you even have to imagine the energy! E=MC squared. Is there another way of looking at that perhaps? Energy = Mass times a constant squared. Perhaps it also describes the relationship between energy and imagination for mass is really solidity and that solidity you see is simply your imagination. Magic is the ability to change reality at will. Imagination is the tool and will or energy is the power to do it. Don’t believe in magic? You should. You work magic involuntarily every second of every day. Want to gain control of YOUR life? Learn how to really imagine, visualize and dream. Want to lose our power to create reality forever? Forget what imagination is. Read the book The Last Observer – out now!